Chuck mentions it’s the first Mazhar in the Americas. It was built in 1986 to honor the Sufi Saint, Bawa Muhaiyaddeen. Aman and I get a small tour with Chuck around the Mazhar and the prayer area. Thirty minutes pass and it’s time for us to hit the road towards Philadelphia. There is something special about this place and I feel it would be criminal to leave. I tell Aman to give my salams to the people in Philly and decide to stay back. The following photos are taken at the East Fallowfield farm branch of the Bawa Muhaiyadeen Fellowship. 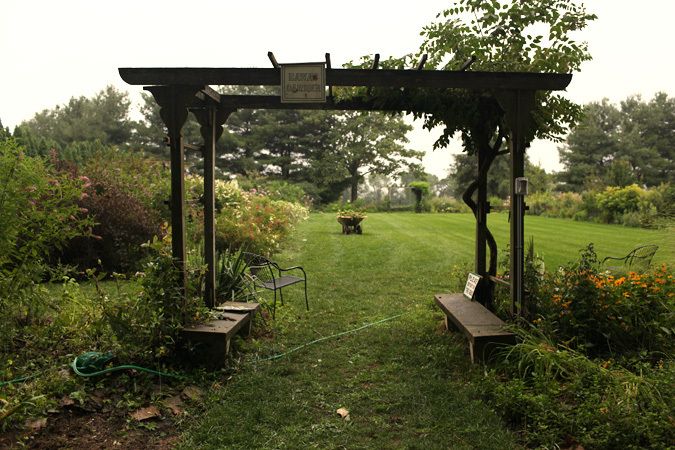 The entrance to the Bawa Garden, a small farming grounds where the congregants were encouraged by Bawa to farm. 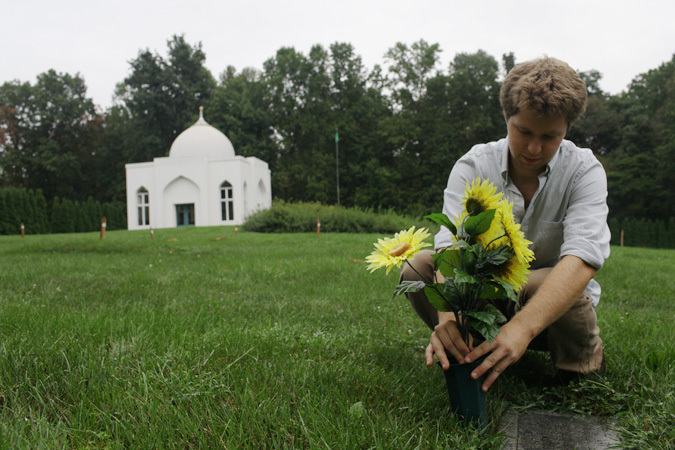 Noah places flowers near his grandfather's grave at the burial site by the Mazhar. Noah is a third generation member of the fellowship. 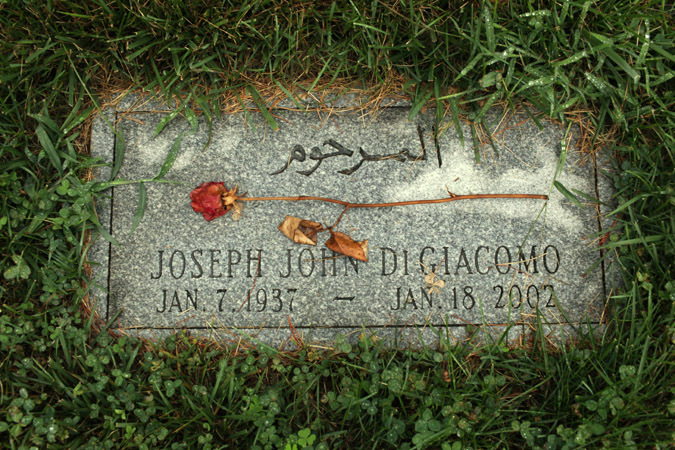 The headstone of a fellowship member. 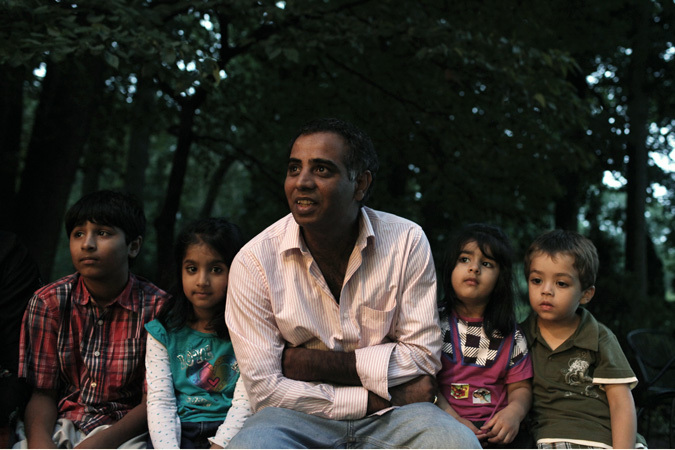 Bawa bought the East Fallowfield farm land because the difficulties they faced in burying through the government. This land gave them the autonomy to bury the dead with the dignity they deserved, Muslim or non-Muslim. A picture of Bawa Muhuaiyadeen inside the center. 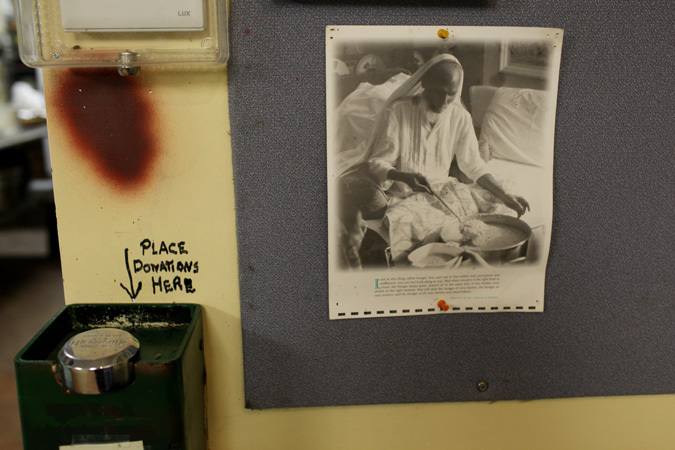 Pictures of Bawa can be found throughout the center. Except for the prayer areas of course. 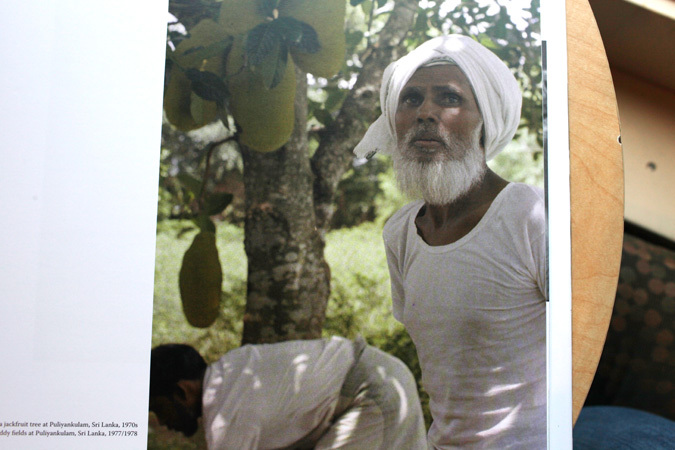 A picture of Bawa Muhuaiyadeen from the photo book, "The Mirror." Bawa's short time in Pennsylvania was well documented and photographed by the fellowship members. Khalida supplicates at the tomb of Bawa. People from all over the world come to visit Bawa's Mazhar. 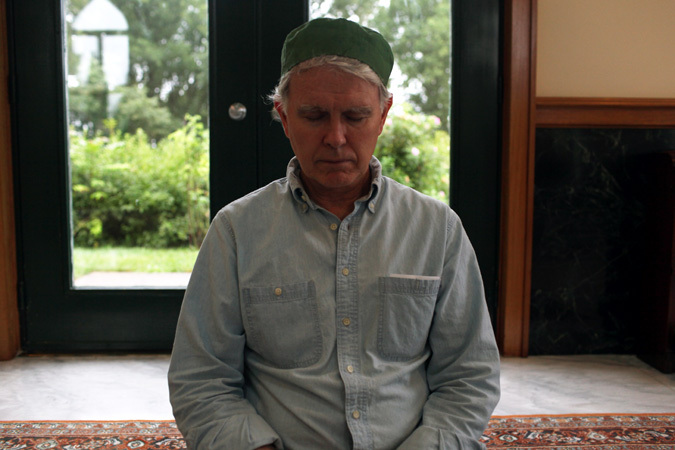 Chuck, our guide at the East Fallowfield farm, takes a minute to meditate at the Mazhar. Unlike most Mazhars in South Asia, Bawa's is a quiet and tranquil place. No singing, music or speaking is allowed. 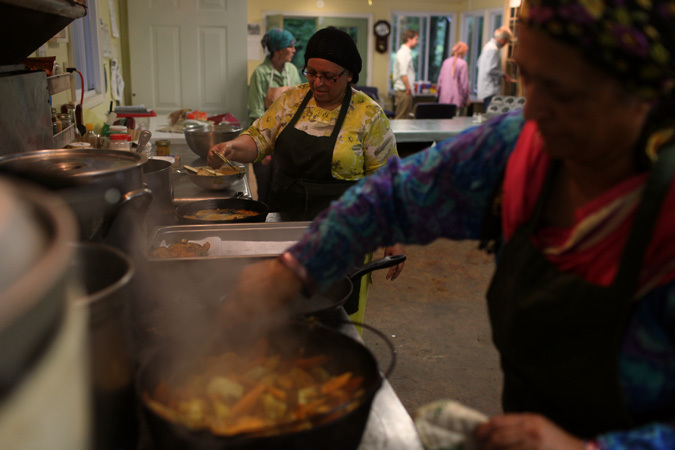 Tayba, left, and her sister, Khalida, cook vegetarian dishes for iftaar. Both sisters are from Peshawar, Pakistan and have been a part of the fellowship for more than ten years. A Pakistani family traveled two hours from Virginia to pay their respects to Bawa and break their fast with the congregation. 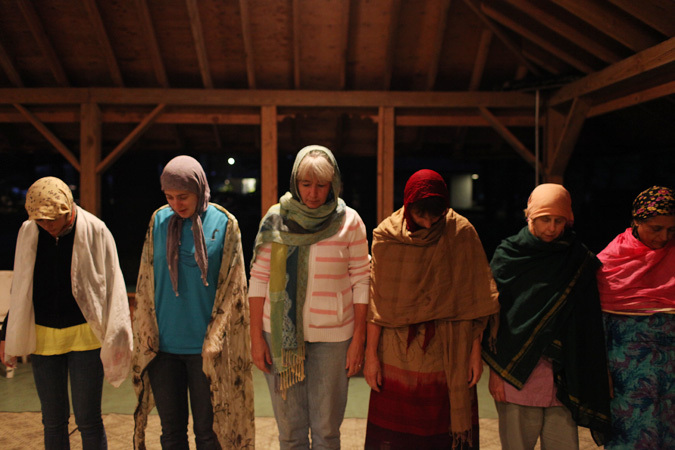 The women of the fellowship line up for the maghrib prayer. 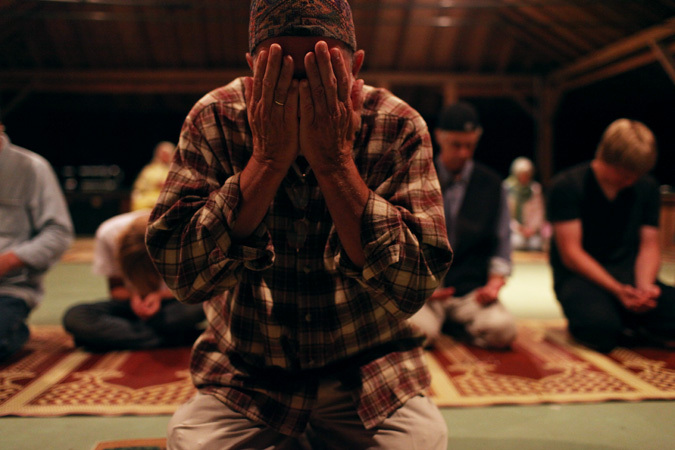 A small group supplication takes place after the prayer in the outdoor mosque. 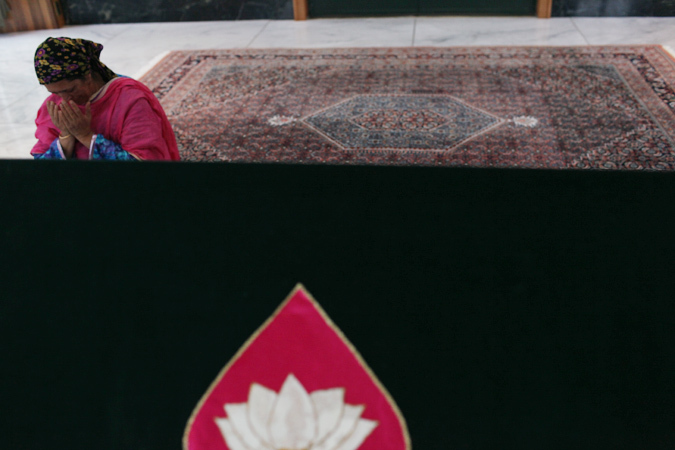 Mohammad Abdullah, the caretaker of the mazar, leads the congregation in supplication. 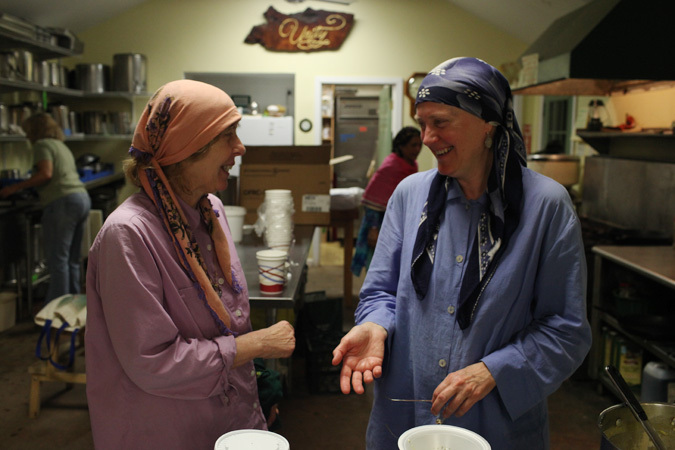 Nina and Sohaiba, two veteran members of the fellowship, clean up after the break fast dinner. 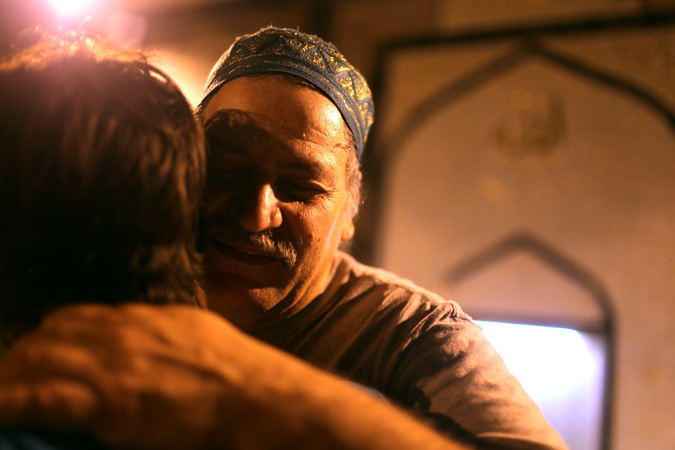 Two congregants embrace each other after the Ramadan night prayer in Philadelphia. The masjid behind the congregants was the first masjid to be built in Pennsylvania that resembled a mosque. Bawa designed the complex. Wow; best posting, yet with some really great photos. But, I did really enjoy last years long text descriptions as well. I mean, what are you guys thinking about these places; how is it shaping your spiritualism, etc? That kind of reflection and growth was really captivating last year in NYC. Great photos of an interesting spot, guys. Wow this is awesome! Love your adventures/stories and the pictures are a great touch. I’m glad you decided to take pictures for this place; I don’t think words alone could have done it justice. SubhanAllah, it’s so serene. You can tell it’s such a warm community, and I’m totally in love with the outdoor mosque. SubhanAllah! I visited this Mazaar last month and it truly is an amazingly calm and peaceful place.. Thanks for the amazing pics! Wow, mA! I didn’t even know a place like this existed. Thanks for sharing with us. They have a masjid in philly itself. Bassam, you’d like it. so, what’s the story behind this place? completely unaware such a masjid existed- what a great insight to share with everyone. Wow! Extremely interesting! What a great experience. Salam! What a journey! look forward to checking in every day. Fahad, try http://www.bmf.org for the story. Salam. I’m reading this from Johannesburg, South Africa, and I’m hooked! Thanks for sharing your experiences. South Africa??? Whoa, thats awesome. Welcome Razina, thanks for enjoying the project! wish Allha would call me here the way he call others to this calming place Amin,”Jazak Allah” thanks for sharing the unforgetable place of this tiny world. Reading from California – loving this and hoping one day yall can come to Cali! I didn’t know there was such a thing as a Muslim saint. it all looks very peace-and-love-y, but as a mainstream unhyphenated Muslim, I don’t get the whole special burial area thing. Beautiful spot, but i’m gettin’ a weird vibe. A true example of how Dawah is supposed to be done. In the example of the Prophets, Companions, and Saints (Awliya). There is scarcely a city let alone a land in the Islamic World where the deen did not spread by the presence and at the hands of such men and women. The graves of the rightious have long been sites for visitation emulating the grave of the Prophet just as those buried in them exemplified his teachings. 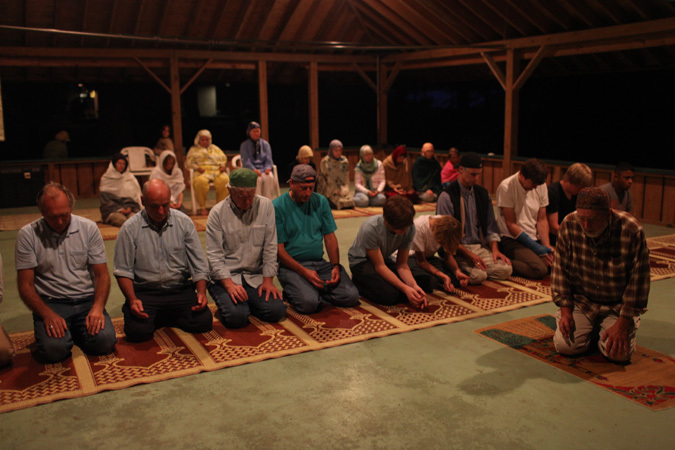 The community is an amazing example of traditional Islam and cultural integration. A true example of how Dawah is supposed to be done. In the example of the Prophets, Companions, and Saints (Awliya) who spread the faith to the far corners of the earth. There is scarcely a city let alone a land in the Islamic World where the Deen did not spread by the presence and at the hands of such men and women. The graves of the righteous have long been sites for visitation, emulating the grave of the Prophet (saw) just as those buried in them exemplified his teachings. The community is an amazing example of traditional Islam and cultural integration. hmm I dont want to sound wierd but i do hope people are distinguishing between visiting the place of a past saint to acts of worship to Allah alone ,, In the teachings of Islam supplication in front of- directed towards a saint – tomb would be a grave mistake. As all worship is to be directed to Allah alone and prayig to the dead saint/tomb would be a major mistake. I am pointing this out as I know such mistakes are seen in many parts of the worls, especially in east/south east asia. Then again this here could just be in rememberance to the saint. Wow! I thought that shrines only existed in South Asia, that there is one in our own backyard is News to me. 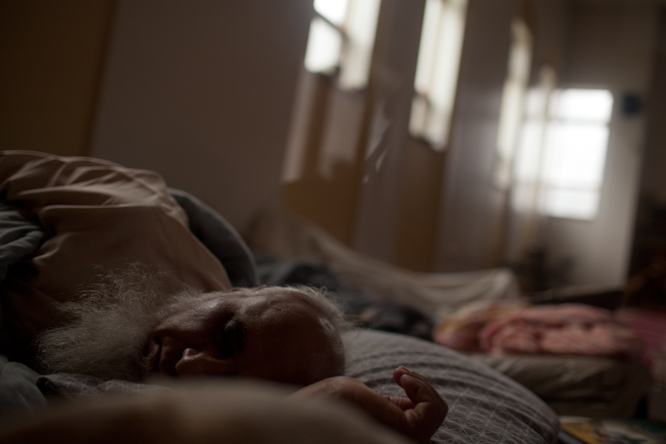 The pictures of congregation remind me congregations that one see in the images of Sufi Islam. Very interesting piece, thoroughly enjoyed it. Next, I am going to Goggle Bawa Muhaiyaddeen. Beautiful pictures. I heard about your blog and journey from CNN news and was very intrigued. I wanted to mention that it suddenly occurred to me that the word ‘breakfast” might have some other meanings. I will go looking for the origins of the word and find out what it might have to do with fasting? To respond to R Mohd’s first comment, only Allah knows for sure, but when anyone from our community is offering supplication (dua) by the resting place of our Shiekh, they are offering that dua to Allah and Allah alone. They are not offering supplication to our Shiekh. As’salaamu ‘alaikum. Salams! Just came across the blog and loving it Small world, those are my aunts, Khalida & Tayaba… haven’t seen them in years! Thank you for then lovely pictures and words. It has been a while since visiting the Fellowship farm and Mazar, but it seems the peace and tranqulity still exists there. May Allah protect you on the rest of your journey. Ameen. Assalamu ‘alaykum! The Fellowship looks beautiful, and serene. I’d love to visit one day, in sha’ Allah. My friend mentioned to me that you guys were out at the Farm a couple weeks ago while his family was there. Alhamdulillah I am glad to see these pictures. The Bawa Muhaiyadeen Fellowship has 2 of the best masajid in the US. It’s been too long since I have been to the farm and the mazar myself, insha’Allah I’ll make it out there again soon. I hope you brothers can make time in your trip to visit more than just Sunni masajid. There are Shi’a centers and masajid all over the US, and despite some of the hold-over hostility amongst the Sunni the US is probably one of the best places for Shi’a-Sunni reconciliation. American Muslim diversity is awe inspiring! I hope the Bawa Muhaiyaddeen Fellowship won’t mind my near visit. 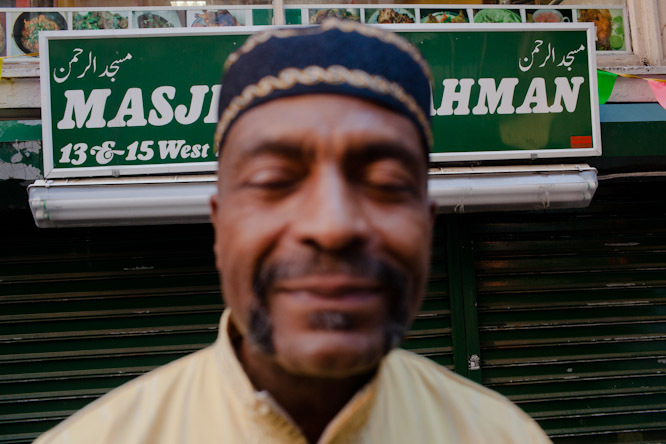 This 30-30 project is a phenomenol public service to the American Muslim community. May Allah reward you both! in effect making “white” muslims predate muslims from asia. reading all the way from Brunei…very interesting.. I love reading your blogs and I find the pictures in this post particularly inspiring: seeing the multiculturalism, the dedication to nature, and the joy and love between brothers and sisters. My God reward you for such a wonderful blog! fear like a results of offers furnished it all.